Training straightness in your horse is important. So important, in fact, that “Straightness” rates it’s very own place on the training scale, right up there at the tippy-top underneath “Collection”. So it’s both a very advanced concept, and at the same time, very fundamental. If we are not aware of, and working towards correcting, our horse’s intrinsic crookedness from the very beginning, we are in effect training his imbalances, reinforcing his crookedness, and making it more firmly entrenched. All of us, horse and human alike, are “sided”. In people we call it right-handed or left-handed, but more accurate terminology would be right-sided or left-sided, as each side of our body functions differently, not just the hands. Since “The horse is your mirror” (oh, how this saying inspires me!) the first step in training straightness in the horse is training straightness in the rider. A rider who sits straight and is symmetrical and balanced, is a necessary first condition for straightening the horse. What makes a straight rider? Here are some questions you can ask yourself: Are the bottoms of your feet both the same distance from the ground? Are both feet in the same place in the stirrup and facing towards the front, or does one toe stick out more than the other? Are your reins of equal length? Is a line down your spine straight, and aligned with the mid-line of the horse? Do you have your ear, shoulder, hip, and heel in alignment? Does your torso form a rectangle, not a trapezoid? Are your shoulders parallel to the horse’s shoulders, your hips parallel to the horse’s hips? Are you able to bring your inside shoulder back and outside shoulder forward on a circle to match the curvature of the circle, the same amount going both ways? Don’t worry if the answer to some of these questions is “No”! Just join the crowd, and start working on some off-horse exercises to enhance your own straightnes and symmetry. Your straightness as a rider is rooted in a strong core. If your core is strong and stable, it will give you a firm foundation to either move or not move your extremeties as the situation demands, without deforming the integrity of your alignment. 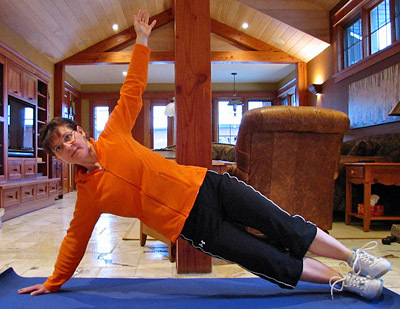 Today I’m going to talk about one of my favorite exercises for achieving this goal: the side plank. It takes literally a couple of minutes a day, and can be used four to five days a week. It challenges your balance and trains the muscles all around your core, especially your obliques, and the gluteus medius on the hip. To perform the side plank, lay on one side on the floor. Then prop yourself up on either your elbow or your hand. You can raise the other hand straight up in the air to work on balance. Pick your hips up in the air, to create a straight line from shoulders to feet. Push into the bottom edge of your bottom foot (I find I need to wear shoes or my bottom foot can’t manage the pose for long). You should feel this most on the side closest to the floor. Hold for thirty seconds to start, and work up to two minutes, each side. Once you can hold it for a minute, try adding in leg lifts, lifting the top leg as a unit up towards the ceiling and slowly lowering it back down. Keep your breathing deep and regular. A goal of twenty leg lifts during a sixty second plank would be awesome. Keeping your form and your control is the highest priority, so if you are wobbling and getting distorted, dial the difficulty down a bit until you can maintain perfect form at all times. In the above photo, you can see that I started to get a bit crooked (twisting a bit backwards) as I had to balance with my leg up while waiting for the photo to be snapped. If you feel this happening to you, back off a bit on the difficulty and don’t lift your top leg so high, and go for perfecting your form first.